“Black people are not dark-skinned white people,” says advertising visionary Tom Burrell. In fact, they are a lot more. They are survivors of the Middle Passage and centuries of humiliation and deprivation, who have excelled against the odds, constantly making a way out of “no way!” At this point in history, the idea of black inferiority should have had a “Going-Out-of-Business Sale.” After all, Barack Obama has reached the Promised Land. Yet, as Brainwashed: Erasing the Myth of Black Inferiority testifies, too much of black America is still wandering in the wilderness. In this powerful examination of “the greatest propaganda campaign of all time”—the masterful marketing of black inferiority—Burrell poses 10 provocative questions that will make black people look in the mirror and ask why, nearly 150 years after the Emancipation Proclamation, so many blacks still think like slaves. Brainwashed is not a reprimand; it is a call to deprogram ourselves of self-defeating attitudes and actions. Racism is not the issue; how we respond to racism is the issue. 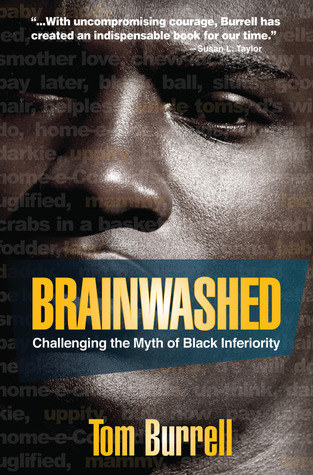 We must undo negative brainwashing and claim a new state of race-based self-esteem and self-actualization. Provocative and powerful, Brainwashed dares to expose the wounds so that we, at last, can heal. This entry was posted in Books and tagged black inferiority, brainwashed. Bookmark the permalink.